Cincinnati, Ohio: Writer's Digest Books, 1990. 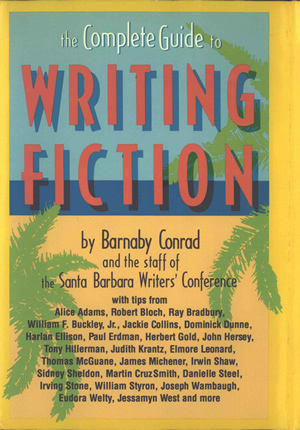 The Complete Guide to Writing Fiction is by Barnaby Conrad and the staff of the Santa Barbara Writers' Conference. This is a volume of speeches given at the conference over many years, including a speech by Tony Hillerman entitled "Dialogue," beginning on page 65. There are many contributions by other very famous writers as well. The volume was published by Writer's Digest Books in 1990. This is a hardcover book with a dust jacket. Style and Language, William F. Buckley Jr. Binding: Fully bound in blue cloth-covered boards. The title, author name, and publisher logo are embossed on the spine in metallic blue.